Saree, the long 6-yard fabric holds a special place in every woman’s wardrobe. We all have grown up watching our mothers getting dressed up in sarees and always wished to wear them when we grow up. Whatever style statement you prefer, traditional or modern, saree is that one garment which never lost its appeal through the ages and still continues to grab our attention regardless of our dressing style. A woman who prefers to wear denim and tunic would feel the exact same way about saree as a woman in kurtis feel. Every woman will agree with the fact that saree has a timeless appeal and it won’t ever be out of fashion ever. Always wear your heels before you start to drape the saree. This will go a long way in bringing out the perfect finished look. 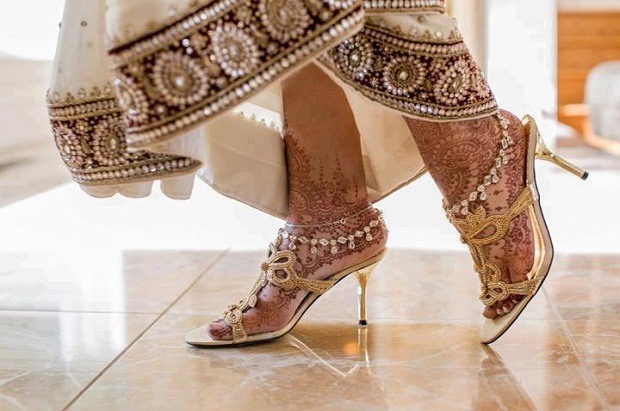 Especially, if you are aiming to show off your slender curvature and draping saree tightly over the hips, then heels should be worn at the start so that they hid behind the drape and add length to your torso. If you are going to drape saree like an Indo-western outfit, keep in mind to not go overboard with experimentation. Keep it subtle and low-key. For instance, if you are going to drape it in dhoti style, make sure you wear matching coloured leggings with it. Also, choose the right fabric for dhoti drape. Never choose a silk saree. Instead go for chiffon or georgette fabrics as they look great with the dhoti drape and the pleats come out nicely. 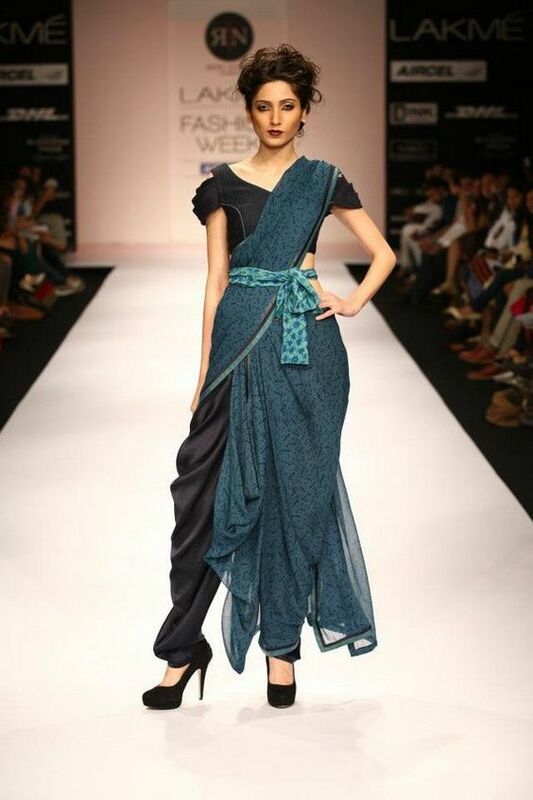 Take inspiration from dhoti drape styles of Maharashtra and Tamil Nadu. Also, while draping make sure that the saree does not go above your ankles as that would take away the grace which saree brings otherwise. The top pallu should be kept across the shoulder in the same way in any regular saree drape. While draping a silk saree with a modern twist, you can choose a lighter fabric than usual. To give it a completely modern make-over yet retain its elegance, tie a waist belt after you have draped it and set the pallu over your left shoulder. Make sure that saree is pinned properly before you tie the belt. Pleat it well on the shoulder and do not make the mistake of keeping the pallu open. Choose a metal belt over a leather one. One shoulder drape is making the fashion headlines these days. From Sonam Kapoor to the runway models, everyone is adorning the one-shoulder drape. In this style, the pallu is draped on one side. This style resembles the Gujarati way of draping saree and saree is kept like a stole. So it is very much a modern Gujarati drape but without tucking the saree on the front. To perfect the drape, wear the pallu from one side from behind and let it fall in the front. The pleats are made in the same old traditional way. You can choose to show off the pleats by making a well-pleated pallu on the front without tucking it over the waist. 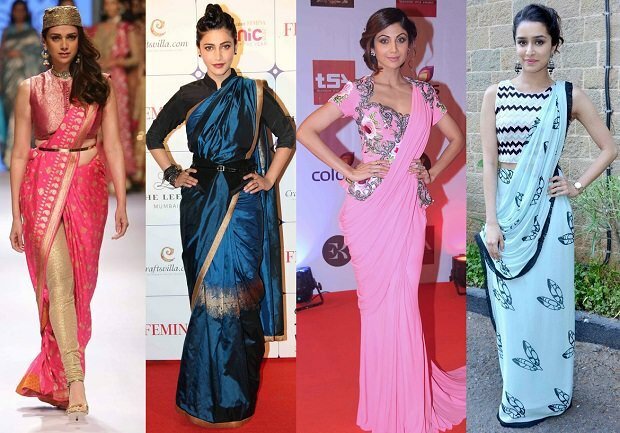 Sash pallu trend is especially the signature trend of Bollywood divas. This modern saree look brings all the focus on the choli or the pleated part of the drape. Also, this drape will highlight your blouse. So while draping it, you need to take care of a few things to get the perfect look. First, you can pull the pallu through the strap of the blouse or hold it on the blouse neatly pleated and in a stylish manner. Second, make sure that the pallu is pinned so that it does not cover the entire waist or the blouse. Third, pleat your saree well and tuck it properly into the petticoat in a way that it looks like a choli. Spread the pleats a little so that it does not form a bulge at the navel. Saree draping depends a lot on the blouse style. In fact, blouse plays a major role in modern saree draping style to create the contemporary look. You can play around with blouse styles such as halter neck, strappy blouse, off-shoulder, elbow length, full sleeve blouse etc. and drape the saree accordingly. 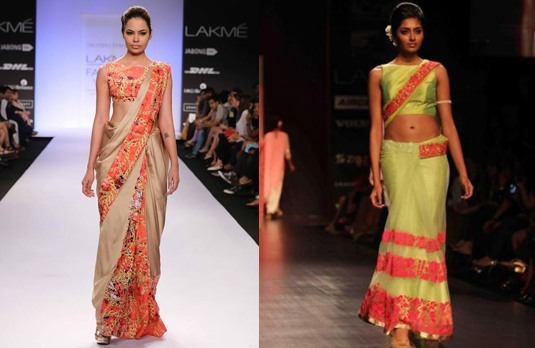 Besides the traditional blouse, you can pair a tube top, crop top or a peplum with the saree. For instance, if you are pairing a tube top with the saree, drape the pallu in a way that it stays open. You can carry it by making a full circle from the back so that it rests on your arm. If you are going for a peplum blouse, the saree can be draped in Gujarati style. This style will accentuate the peplum saree look and the palluwould look like a stole coming to the front. Never go too far in experimentation that you make a joke out of your drape. Know how to pick the right drape with right saree style. While wearing net saree, avoid pleating the pallu. Do not drape the saree by tucking it too low.